P1975 Kicking Mule Records.Sonet Productions Ltd.
Sonet Records Ltd., 12 Needham Road, London W11. The Jackson Stomp was learned from a performance by The Mississippi Mud Steppers on Old-Timey 101. Mission Street Blues is derived from W.C. Handy, but closer to tunes by Jelly Roll Morton and especially to Charlie Poole’s ‘Ramblin Blues’ and ‘Tennessee Blues’. Allegheny County was worked up with Dan McCorison, a good friend. Last I heard he was in Boulder, Colorado in a western swing band, Dusty Drapes And The Dusters. Dan came up with this tune about 1969. Zebra Blues was inspired by life in the big city of San Francisco. It is named after the famous series of murders there. Stylistically it is related to Freddie Keppard’s ‘Messin’ Around’ (on the columbia chicago jazz anthology) and the ‘Limehouse Blue’. Standard. My favorite version is the original one, a solo version recorded for Gennety in 1924, and it is that recording which forms the basis for my arrangement. Morton’s Gennet Solos, which are on Milestone M-47018, can be viewed as a bridge between ragtime and jazz encompassing the thematic development and melodic appeal of ragtime and the drive, rhythmic complexity and invention of jazz. Melancoly Baby, Take Me Out To The Ball Game & America are in everyone’s repertoire, of course. I believe they were all written by the same person, probably John Lomax! The Temperance Reel, or Teetotaler’s Fancy, or Darkey’s Dream, or Johnny’s Favorite, is very irish by any name. I first heard it played by Chet Parker on a Newport Folk Festival record. Pineapple Rag is an arrangement from around 1968-69, years before guitarists like Mike King and Ton van Bergeyk made me aware that it was possible to transcribe rags from the piano score, along classical lines. My method was to learn the rags by ear, and make up my own counterpoint, except where the bass line was particularly compelling and necessary to the balance of the melody. Hick’s Farewell is from a striking recording sung by Doc Watson with only Gaither Carlton’s fiddle accompanying (on the Friends Of Old Time Music L.P.). The somberness of the lyrics was highlighted by the starkness of the unison-single line rendition, which I try to evoke. The improvization here, as on Allegheny County is basically modal. Dr. Jazz has been associated with Jelly Roll Morton who recorded a great version of it, and who, I have heard, wrote the words. The tune is by King Oliver. The Old Folks Polka I learned from a friend Lynn Abloty, who played the accordion version of it that Nathan Abshire has recorded for Arhoolie. I believe it is also called the ‘New Iberia Polka’. There Will Be A Happy Meeting is another 3 chord hit. Its presence here is due to a visit the day before a session, from Al Rice. 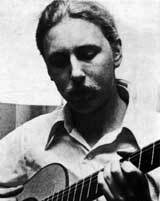 Al, who plays many guitar styles beautifully, had never heard of the great bahaman guitarist Joseph Spence. So we put on his Folkways album and I was reminded what fun it is to play Spence’s style. I really don’t play this much like Spence (he uses a drop d bass tuning, for one thing). If you haven’t heard Spence you’re missing one of the world’s unique and beautiful guitarists. The Wreck Of Old 97 is one of your more durable three chord bluegrass progressions. Personally I am all for 3 chord songs, and I think this country would be better off if people would play more of them. 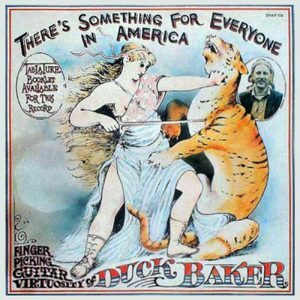 Duck Baker is another of the amazing acoustic guitarists from Washington D.C. Born there on July 30, 1949, he was raised in nearby Richmond, Virginia. At the age of 14, after a brief experience with the ukulele, he became a guitarist, spending the next five years as an arranger of fiddle tunes and rags, as well as holding down the job of lead guitarist in a Chicago-blues band. Duck’s musical influences are unusually varied, ranging from folk musicians like the Carter Family and Joseph Spence to Jelly Roll Morton and John Coltrane. His repertoire is quite large and he is a proficient performer in several fingerpicking styles. His recorded work is at times tightly arranged and precisely performed, and at other times somewhat akin to jazz improvisation within the folk tradition. Earning his living as a carpenter and jazz critic since he moved to San Francisco in 1973, Duck’s articles and reviews have appeared in publications as diverse as the Richmond Mercury, the Berkley Barb, and Coda. He has been a regular performer at the leading Bay Area clubs including the Green Earth, Freight & Salvage and the Great American Music Hall. 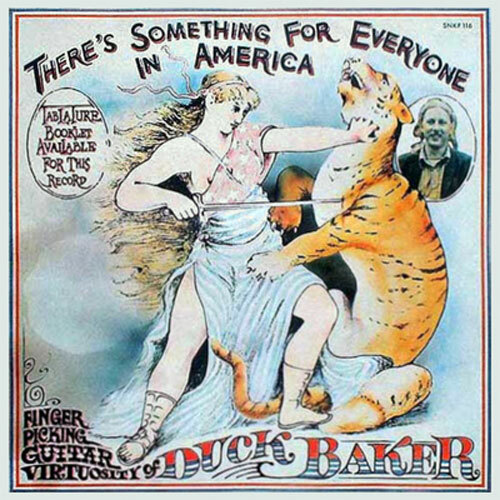 Duck Baker was a featured performer in the 1975 Kicking Mule Guitar Festival.